There are some things only a true, out of this world rocker can get away with. Things like changing their name to an unpronounceable name without a vowel in site. Or, a cosmic rock star might also interact with individuals in unique ways, such as sending a journalist a jarred pig fetus as a thank you gift for an interview. While there are plenty of interesting oddities that rock stars can get away with, nothing is as epic as the fashion influence these stars can have. Take the mullet for instance, before this hairstyle was popularized by musical artists mullets were hardly glamorous, they were mostly for hockey and soccer players. However, once a couple stars brought out the glamor in the hairstyle it spread like wild fire. 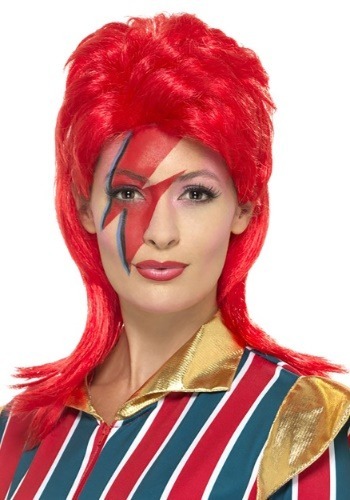 This fiery red wig has that dazzling style that will set you apart from all those simple musicians that are trying to make it because when you're a space superstar you'll need an intergalactic hairstyle to go with your out of the world lifestyle.